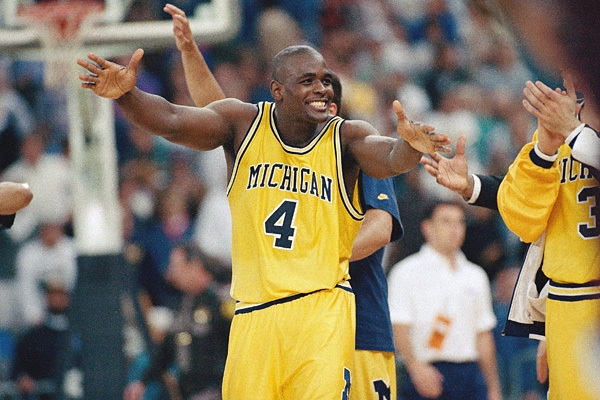 Should Chris Webber be at the NCAA Championship tonight? What has developed into one of the bigger stories regarding the NCAA Tournament Final tonight between Michigan and Louisville (here is my prediction) has nothing to do with the players on the court tonight but instead surrounding someone who left Ann Arbor 20 years ago. Jalen Rose made headlines in a BS Report podcast by urging Chris Webber to attend, along with the rest of the Fab Five, tonight's NCAA Championship in Atlanta. Rose said this morning he was waiting to hear back from Webber but it does not seem likely that Webber will be in attendance, even as the game takes place in the town where he works for Turner and NBATV. Webber has stayed away from his alma mater after become embroiled in major allegations regarding his and others' connections with booster Ed Martin, allegations that resulted in the vacation of the Final Four appearance in 1992, the entire 1992-1993 season, placing the program on probation as well as the program disassociating itself from Webber for ten years (which ironically concludes today). Rose believes that Webber is staying away because he is still haunted by his infamous "timeout" in the 1993 National Championship when the team didn't have any left, resulting in a technical foul that all but wrapped up the title for North Carolina. Honestly, I feel that Webber should be in attendance tonight in the Georgia Dome and here is why. For starters, I think that Rose is being a little unfair in making this situation public. Did he really have to go out and make a big deal about how Webber should be in attendance tonight? Had he instead kept this issue between him and Webber, since it really is an issue between the two of them as none of the other Fab Five has gone public to my knowledge with their desire for Webber to show up tonight. Webber does not owe it to Rose to be there tonight and quite frankly, it really is not Rose's business to tell Webber that he should show up. Webber is an adult and he can make his own decisions. That said, Webber should be there tonight. There is not a doubt in my mind that Webber still feels haunted by the timeout call, and one could still make the argument that it may still be the defining moment of his basketball career. I also think that he feels ashamed that he was the poster-boy for the Martin scandal that really damaged the program. But that stuff is all in the past and Webber owes it to his school to be there in support tonight. The program has recovered from the scandals and now has the chance to be a national champion. Webber may want to continue to run from his collegiate career, but he cannot do it forever. If he shows up tonight, all that of the past will be put behind them for at least tonight in support of the Wolverines as they go for their second title. So while I think Rose is being a little unfair by going public, I do think he is right and the Fab Five should be together again 20 years later to support the alma mater.